October 2018: Virginia Tech has withdrawn from the Dual Bachelor of Science in Mechanical Engineering (BSME) degree programs with the Technische Universität Darmstadt. These programs are therefore no longer available to Virginia Tech or Technische Universität Darmstadt students. These programs allow students at one university to complete the senior/final year of their Bachelor of Science (BS) degree program by attending courses at the other university and still graduate on time. When you arrive at Frankfurt airport, you will go through immigration, pick up your checked luggage, and then go through customs. In the case of Terminal 1 (most flights from the US arrive here), you will then exit at the ground level (Level 1) at exit "A", "B", or "C". If you are being picked up or are meeting up with someone, then you should go to the meeting point ("Treffpunkt") between exits "B" and "A" in the case of Terminal 1. The meeting point is a waiting area that is designated by a blue sign with four white arrows pointing towards a red dot in the center (see airport map). The easiest way to travel between Frankfurt airport and Darmstadt is to use the bus knows as the Darmstadt AirLiner. The AirLiner goes from the airport directly to the main bus station in Darmstadt. From there you can catch a taxi or transfer to another bus to your destination within Darmstadt. The Summer 2018 cost is EURO 8.70 each way, which includes transfer using a bus or tramway within Darmstadt. We often use Haus Martin for short-term and summer housing. 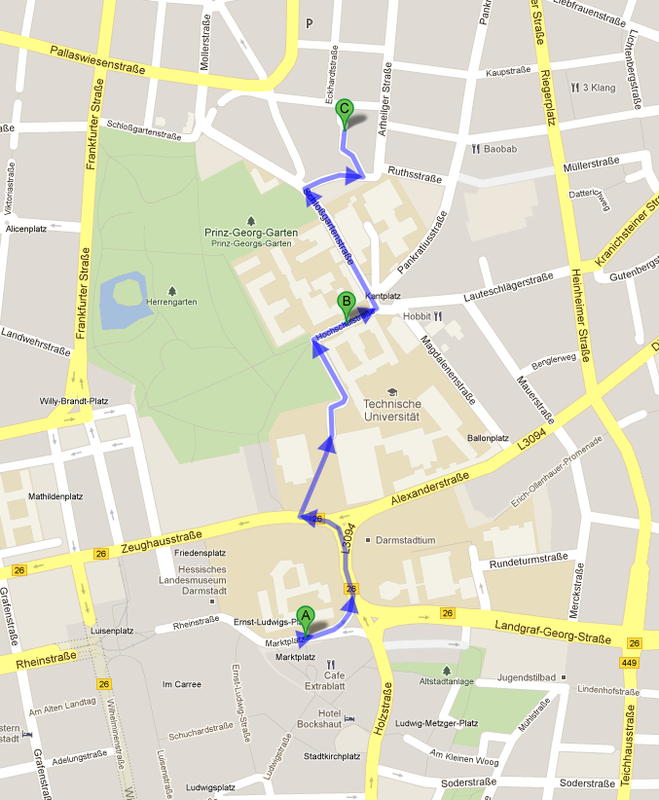 As can be seen on the Google walking map, the apartment building (C) is within short walking distance of the TUD Sprachenzentrum (B) and the bus stop by the Schloss (A). Student group at Technische Universität Darmstadt (TUD) dedicated to welcoming students to TUD, helping them settle in, and discover the best of what TUD, Darmstadt, and Germany have to offer.